Heart medicines are still being extracted from the foxglove, i.e., the species of the genus Digitalis. 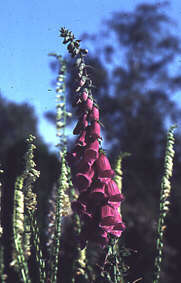 The foxglove played no significant part within the school medicine during the 17th and 18th centuries. This however changed in 1775 when the English doctor, William Withering, described having observed how a traditional healer from Shropshire successfully treated a case of dropsy with a decoct of foxglove. Dropsy is a form of oedema (swelling) that can be caused by inadequate heart function. This observation triggered Withering to experiment with foxglove on patients with dropsy. In 1785 he published his results in the book ”An Account of the Foxglove, and some of its medical uses: with practical remarks on dropsy.” Ever since then Digitalis leaves have had worldwide success. The first time a mixture of so called cardio-active glycosides was extracted from the leaves of the foxglove was in the middle of the 19th century. Since then chemical methods have improved and we can now differentiate between the various Digitalis-glycosides and today we are aware of many different ones. Several of these are registered drugs in Sweden. Very similar substances are also found in the lily of the valley (Convallaria majalis) and in the common toad (Bufo bufo). The lily of the valley is very toxic and the poison consists of various cardio-active substances. Its leaves used to be sold at pharmacies as heart medicine. The leaves of the floxglove contain very potent heart drugs and should therefore not be eaten.